IEF is very excited to start a new interview segment in our eNewsletter, aiming to have conservationists explain their work in their own words. We hope to inspire and show what it takes to be on the front lines of elephant conservation. We are honored to have our inaugural interview with Dr. Michele Miller. 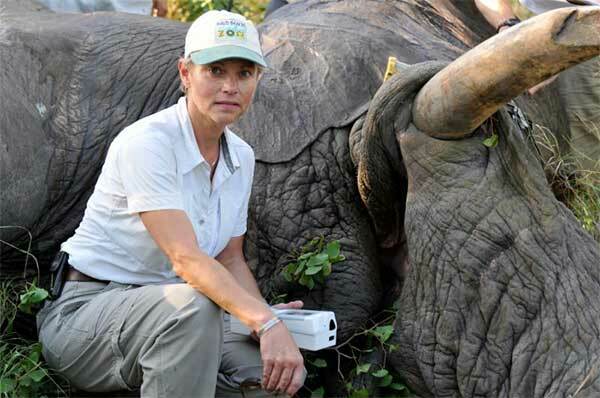 She has extensively studied tuberculosis in elephants and her project Disease Risk Analyses for Tuberculosis Detection and Prevalence in Elephants was supported by IEF. Question: Where did you study? How did you get started? Dr. Miller: My graduate studies were completed at the University of Wisconsin-Madison, where I received a MSc and PhD in veterinary immunology and a DVM. This was followed by a post-doctoral fellowship at the San Diego Zoo Center for Reproduction of Endangered Species, investigating immune responses to various infectious diseases of wildlife. This training along with practical experience as a zoo veterinary clinician has provided a broad base for my current research. Question: What first inspired you to focus your research on elephants? Dr. Miller: I’ve always been fascinated with elephants since a child. Once I became a zoo veterinarian, I had the opportunity to work closely with these species and developed a life-long commitment to improving our knowledge to provide better welfare for human-managed animals and conserve wild populations. Question: When and where did you first see an elephant in person? How did it affect you? Dr. Miller: As a young child, my family would take me to the Milwaukee Zoo. I was enthralled watching the elephants and decided I would become a veterinarian working with wildlife. I also remember the annual circus parade in which the elephants walked down the street – their massive size and magnificent presence left a lasting impression. Question: How important is it for the public to experience elephants in person and be inspired to care? Dr. Miller: I think that it is very important for the public to have the opportunity to experience elephants in person. Being in the presence of elephants stimulates multiple senses – visual, olfactory, and auditory experiences that create a more complete awareness of elephants than can be provided by media such as television. Watching their complex behavior gives insight into the important role elephants play in their environment and help inspire people to learn more and become involved in conserving these species. Question: What do you wish was more widely known about elephants? Dr. Miller: Elephants are subject to many of the same health issues that confront other long-lived species such as humans. For instance, degenerative joint disease occurs more frequently in older elephants, just as in us as we age. Elephants are also susceptible to a variety of infectious diseases, including TB and a type of elephant herpesvirus. Question: What misconception about elephants would you like to correct? Dr. Miller: Elephants have very complex social interactions, which we are still learning about. They communicate through touch, smell, sound, and visual cues. It is important for their welfare that we provide adequate space and opportunity for elephants to interact with each other, whether it is in managed care or the wild. Question: How can in-situ and ex-situ conservation work hand-in-hand? Dr. Miller: We can learn and study animals in both the wild and managed care to understand the biology and behavior of these species. Ex-situ conservation activities can provide insight into nutritional needs, disease issues, and techniques for handling, transport, and other management, that might take much longer and be logistically more difficult to determine in wild populations. However, the information we gather from in-situ conservation creates a valuable knowledge that can improve the welfare of managed elephants. The conservation work done in-situ and ex-situ should be synergistic. Question: How would you explain elephant TB to someone who has no experience in elephant management? Dr. Miller: TB in elephants can be caused by the same bacteria that cause TB in humans and cattle. Most cases of elephant TB are the human form. Like humans, it is a very slow chronic disease and many elephants can be infected for years without showing any outward signs. TB can be diagnosed by taking samples from the trunk, similar to how humans are sampled (sputum), although the bacteria may not always be present even if an individual is infected. Therefore, it is important to improve our knowledge and tools for detecting TB at earlier stages so that we can prevent development of disease in the affected animal as well as minimize the risk of transmission to other animals and people. Question: Is elephant TB treatable or curable? Dr. Miller: Elephant TB can be treated with a course of drugs for human TB. Some of the challenges are that the drugs need to be given over a prolonged period of time (up to a year or more) and they can cause side-effects which may delay completion of treatment. Whether TB is cured or not, is difficult to determine, even in humans. Since we are unable to take chest x-rays of elephants or determine changes in disease, we don’t have good measures of how effective treatment is. However, our experience has shown that the treatment can stop the secretion of bacteria which is a risk to other animals and important in managing this disease. Question: Can humans contract TB from elephants? If so, under what circumstances? Dr. Miller: Although it is possible, there are no documented cases of a person getting the disease from an elephant. Under rare circumstances, people who are in close contact with elephants (such as handlers) have been shown to have a positive skin test (this is a test of exposure to the bacteria but doesn’t necessarily mean that a person has disease). Similar to TB in people, we believe that causal contact with elephants (such as at a zoo) presents a very low risk. It is probably more likely that you would get infected from other humans than elephants. Question: How does elephant TB affect elephant conservation work? The future of elephants? Dr. Miller: TB, like any disease issue, can impact conservation directly through loss of valuable individuals as well as indirectly through potential regulatory restrictions on movement of animals for translocation. There is incomplete understanding of the impact of this disease in both ex-situ and in-situ populations. Since this slow disease is difficult to detect even in elephants under managed care, we may not truly understand the potential impact on elephants into the future. Question: Is there anything else you’d like to add? Michele Miller, DVM, MPH, Ph.D.
Michele Miller, DVM, MS, MPH, Ph.D., is staff veterinarian of wildlife medicine at the Rare Species Conservatory Foundation,. Specializing in immunology, infectious diseases and interaction with the environment. Conservation projects include desert pronghorn (Mexico), and pygmy hippo (West Africa). Current in situ projects focus on elephant and rhino issues in Africa, as well as tuberculosis issues in New World primates, elephants, large cats, wild ungulates and other captive and free-ranging wildlife.